2. Blinking LED type Facility. 3. Fire/ Reset attach switch facility in P.S.type. 4. P.S. and M.S. type available. 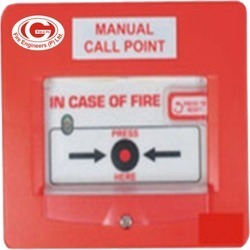 Riding on unfathomable volumes of industrial expertise, we are providing a broad array of Fire Alarm Manual Call Point. So as to uphold the standing we have built up, we are engrossed in presenting a broad compilation of Manual Call Point. As the name suggests, this hi-tech device can manually override the audio visual devices. To be used only in times of emergency, Ceasefire's Manual Call Point works in integration with the entire system, ready to come to the rescue 24x7. The manual Call Point is tough, durable & highly visible. Alarm LED/s is provided inside the Call Point to indicate the Alarm condition. - Available for flush or Surface Mounting. - Suitable for majority of conventional Fire. - Front protection glass cover. - Glass protection by thin film. The Manual Call Point is tough, durable & highly visible. Alarm LED is provided inside the Call Point to indicate the Alarm condition. 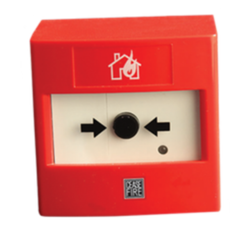 - Suitable for majority of conventional Fire Alarm System.